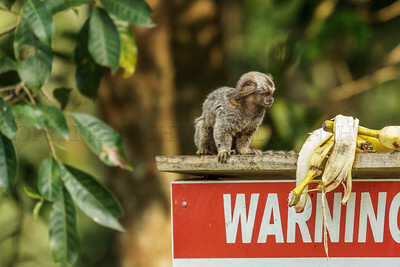 The marmoset is an invader, but so adorable. The Brazilians set up banana stands for him. 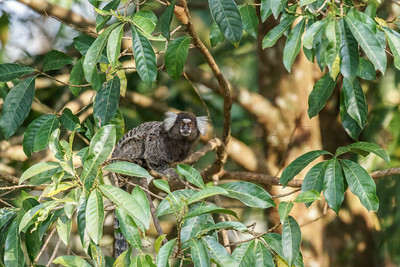 Brazil's endemic marmosets are suffering from lack of forest habitat and the stress of a large population of the Common Marmoset. 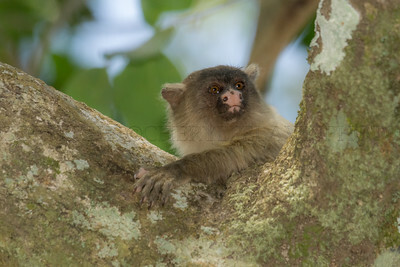 Common Marmosets are often feral versions of one time pets. This Black Tailed Marmoset was in a tree at the edge of the posada where the people, generous with their leftovers, put the food out for the animals. Another adorable mammal. This little creature was right at the edge of the posada where people, predictably, made a bounty of food appear. 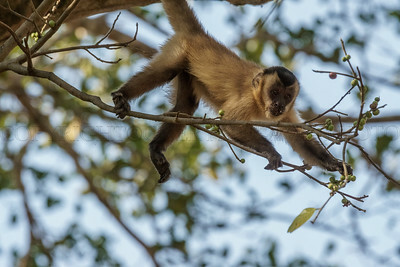 This Capuchin was the most aggressive and greedy of the group. 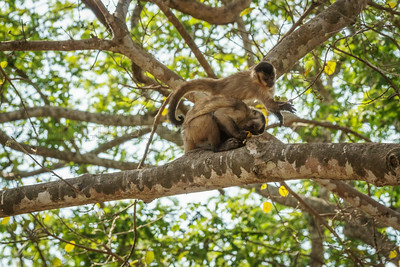 He grabbed up so many bananas that he had to stop and eat one in order to go to a safe place up a tree with the others he collected. Note there is a banana in his mouth, another under his arm and one on the ground! 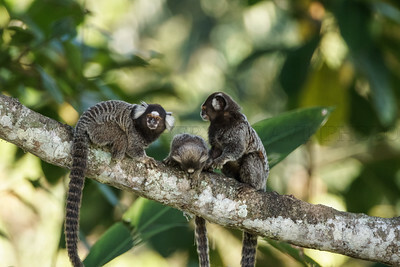 Brazil's Forests used to be rich in marmosets, but the forests are in great need of repair due to thoughtless development. 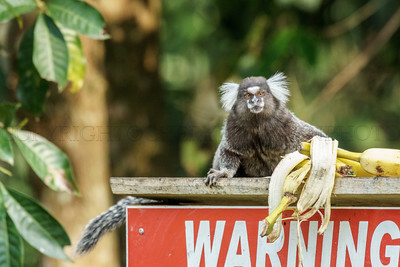 This particular breed of marmoset has become a invasive species in many parts of Brazil. People either intentionally or unintentionally let their pet marmosets loose and they reproduced. It was endemic to the North East coast of Brazil. Again, as a tourist, I thought these were the greatest little animals, but most people around me expressed grief that they were edging out the endemic breeds. REGUA is trying to build connector to the bits and pieces left of the Atlantic Rainforest so that wildlife will have corridors to move about it. It is not hard to see why people love these little monkeys. They are cheeky, rambunctious and adorable. REGUA sustained hummingbird stations and banana tables for any and all. The marmosets and the Red Rumped Cacique along with wasps really loved the bananas. 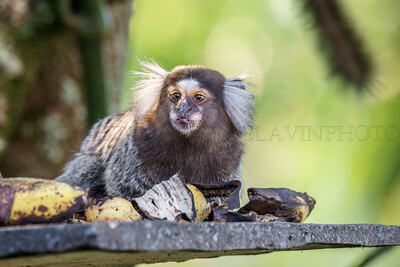 There are a lot of these images because I fell in love with the Marmoset. I was pretty much alone in my fascination. My group wanted to photograph endemic species, not "invasive" species. I was hungry for mammals to photograph and would have happily worked on these little ones for a long time. 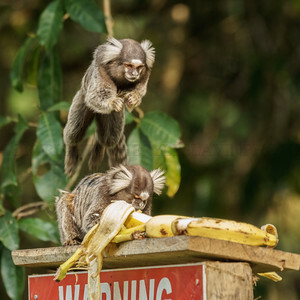 I was very attracted to the way these marmosets went about eating the bananas. They used their hands and eyes, just like we do to check things out, but also dived in head first, as you can see with the individual o the left. The marmoset has claws instead of finger nails and very long tails. 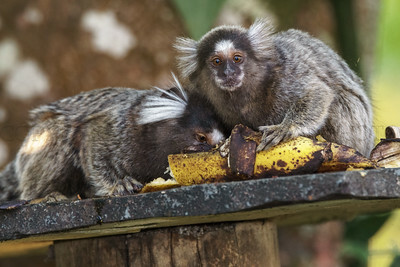 Marmosets would normally live in the canopy eating leaves, fruits and trees. Their sharp lower incisors allow them to chew holes in tree bark to harvest the gum inside. It is a great delight to watch these little guys deal with food and each other. This marmoset is a survivor and like New York's English sparrows, it is edging out the endemic species of the area. 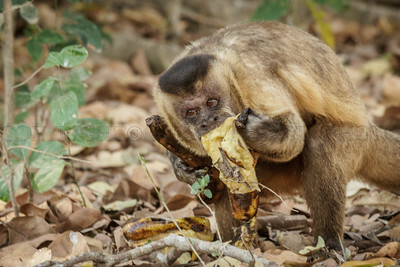 I love the way he is studying his banana. My understanding was that this marmoset was a hybrid. This was confusing because they all looked exactly alike. 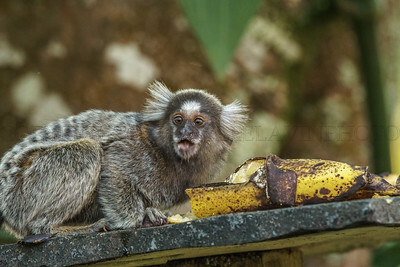 It is not a hybrid, it is the Common Marmoset. My problem was that I spoke no Portuguese and most of the people I met in Brazil had little to no English. After visiting so many places I have become used to expecting English as the universal language, but it is not so in Brazil. Brazil is so huge, it is a world unto itself. 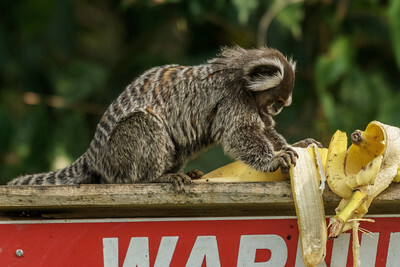 This baby marmoset has decided to leap to his banana as his elder was not sharing. There are no babies that are not cute. Most of the time this group was on the banana table, but this one did me a favor and posed in a tree. At the time I felt very virtuous to shoot the animal in a natural setting, as opposed to the banana table with it's signage. if you look to the left you can see that long tail. The tails looked like they were lighter than air. 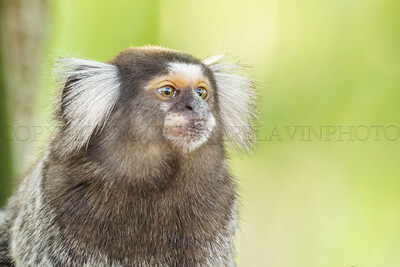 I love the Common Marmoset's smart little face and big white ear tufts.